1 – Connect your device to the power and wait some seconds, a blue ring will start moving on the top of the device. 2 – As the device is new and was never connected to a WiFi network before, the blue lights on the previous step will turn orange after some seconds. 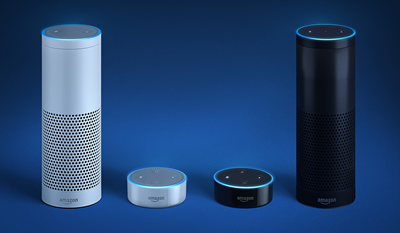 3 – With any device or computer in your house, point your browser to alexa.amazon.com. Tip: If you are using a mobile device browser like a phone or tablet to do the setup, you will need to use the function “Request Desktop Site” on the mobile browser. Otherwise you will be recommended to continue the setup by downloading the Amazon Alexa App (which as mentioned before, is not available on most stores outside the US). 4 – Follow the on screen instructions. You will need to login to your Amazon.com account or setup one (if you dont yet have it) and at some point you will be requested to connect to a Wireless network called “Amazon-XYZ”. “XYZ” can change according to your own device (kind of like a serial number). So connect to that wireless network from the device you are using yo do the setup and go back to the browser to continue the configuration. 5 – Once you are connected to the own device wireless network and after following the onscreen instructions on the page you opened on your mobile browser, you will be displayed with the wireless networks of your house, select the one you want to connect your device to and enter the password of it. 6 – After some seconds, the configuration will be finished and you will be displayed some additional options in case you are configuring a Dot for example. Otherwise you can start right away and start using your device. Note: If the lights of your device turn violet, you will need to disconnect it from the power and connect it again to restart the setup. Important: If you received the device as a present and are having troubles to configure it, it might be the case that the device is associated to the account of the person that purchase the device for you. You will need to ask them to delete the device from their own Amazon.com account for you to be able to configure it on your own. – You can always go to alexa.amazon.com from any device in your house and after login with your Amazon.com credentials you will be able to manage settings of the device and see the history of the things you have asked Alexa. – As I live outside the US and we use the Metric system here in Switzerland, the first thing I did was to go to Settings > Select the device you want to change a setting to and you can activate the metric system for Metric and Distance units. – On the same screen as the previous point under “Sound & Notifications” you will also find a function I like, which is to have a sound feedback whenever you trigger the device by saying “Alexa” so you know the device actually is ready to receive your command. The option is called: “Start of Request”. – On the sections “Skills” and “Things to Try” on alexa.amazon.com you will learn a lot of functionalities of the device. – Until today: Dec. 24th 2016 I couldn’t find a way to change the “Home” device address. I think Amazon didn’t allow this yet, I hope they do it soon. This affects a bit location based functionalities, for example if you ask: “Alexa, whats the weather” you will listen the forecast for the default Alexa Home address which is Seattle. To get the weather from where you live (outside the US) then you will have to say “Alexa, whats the weather in Zurich” for example. – Some people recommend you to download APK files on Android devices that are basically application files that you could run on Android devices if you allow the device to execute files outside the Google Play store. I strongly recommend you dont follow this approach as you can never trust if someone injected some malware to the APK file for example. Although Amazon doesn’t allow you to download the mobile App outside the US, the above steps are an easy way to configure your device. And if you live in the US well, it gets easier thanks to the availability of the mobile app on the Apple or Google mobile app stores and by just following the online screen instructions. There are plenty of websites compiling tips, tricks and findings about what Alexa can do for you, my suggestion play with it and you will discover a lot of things: “Alexa, sing a song”, “Alexa where do you live?”, “Alexa tell me a joke” are just some basic examples.